(3:50 p.m. EDT) -- Celebrity Edge will showcase Celebrity Cruises' most groundbreaking entertainment program when it launches in late November 2018 -- with more entertainment venues and production shows than any other ship in the fleet. 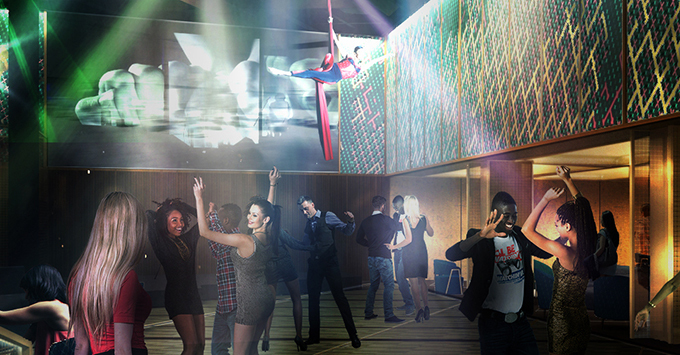 Among the entertainment venues will be a main theater that immerses the audience in shows through cutting-edge technology and special effects as well as a nightclub that sets the stage for laser games during the day and a contemporary theme party at night. "With Celebrity Edge, we have created our biggest and most comprehensive lineup of entertainment to date," said Lisa Lutoff-Perlo, president and CEO of Celebrity. "Entertainment on Celebrity is daring and bold, dynamic and refreshing, surrounding you at every turn." Celebrity Edge's main theater will feature four stage areas and three gigantic, moving projection screens. The main stage extends into the audience creating a partial theater-in-the-round, while a duo-directional platform raises almost seven feet above the stage to lift performers high above the audience. Other high-tech aspects of the theater include two rotating, spiral staircases; 10 synchronized panoramic projection screens, 16 state-of-the-art video mapping laser projectors, and aerial performance rigging. In The Theatre, cruisers will be able to enjoy five new full production shows, including: the Shakespeare-inspired "A Hot Summer Night's Dream," which combines light-hearted theater and acrobatics; "The Jewelry Box," which relies heavily on The Theatre's technology; "Kaleidoscope," a high-energy music and dance extravaganza; and two shows that are part of Celebrity's new Headline Residency program -- "Get Up," a pop concert-esqe show and "The Purpose," a production designed to celebrate the inner self and be uplifting. "We wanted to take the idea of traditional theater and turn it on its head," said Scott Butler, a founding partner of Wilson Butler Architects, the arts and entertainment venue architectural firm hired by Celebrity to design the space. 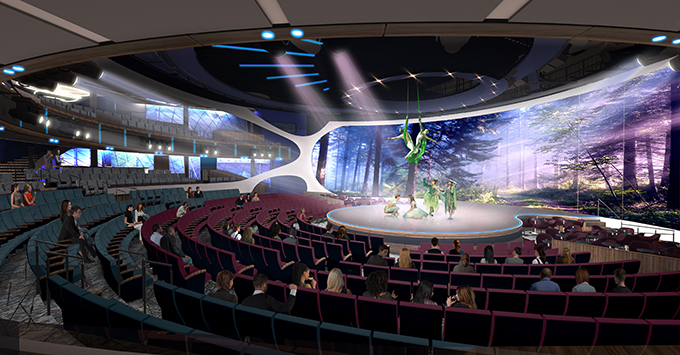 "The Theatre on Celebrity Edge was designed to awaken people -- immersing them in the experience, stimulating their senses and altering their expectations for live entertainment." For the shows, Celebrity turned to Black Skull Creative group, who created several of the experiences showcased during the 2012 London Olympics, as well as Three In One Entertainment and Consulting, whose creations include INFERNO: The Fire Spectacular in Las Vegas. 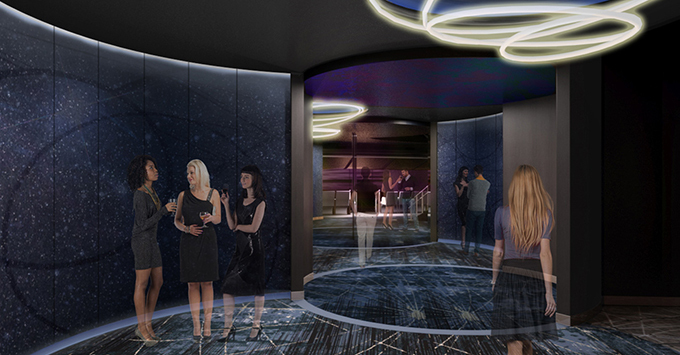 The ship's nightclub, The Club, will be active from morning 'til night, with high-tech activities during the day and a contemporary speakeasy vibe at night. During the day, cruisers will find the Funovation Laser Maze Challenge (a game in which players must navigate through a field of lasers), as well as the Drone Hunting laser obstacle course (a virtual game in which players can test their aim as they target their opponents' drones). As the sun goes down, Undercover at The Club puts a contemporary spin on the Prohibition era with 1920s-inspired craft cocktails and an aerial saxophonist. Other cool technology used in the space are the futuristic body scanner referred to as Andromeda that "transforms" cruisers into someone else for the evening, and the Hypno Cam Experience, an at-sea dance party featuring a high-tech camera that's passed around to capture photos, which are instantly displayed on a giant LED screen. 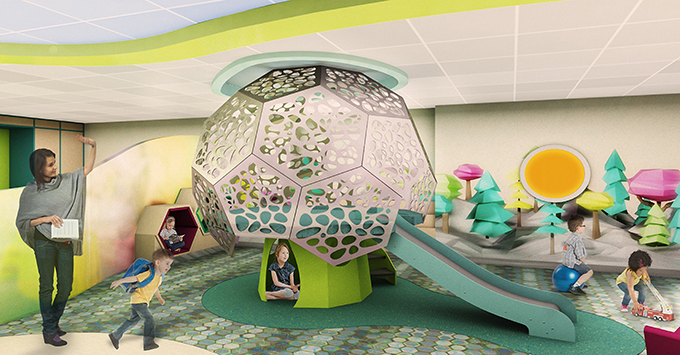 In addition to new entertainment venues, Celebrity revealed some of the activities that will be on offer for little ones. The line's youth program, Camp at Sea, will have more than 500 activities to choose from, including the line's first youth coding class as sea. The program will offer two separate spaces, one for kids and the other for teens. Other standout features of the 2,900-passenger ship include "infinite" balconies, which can be either an outdoor space or provide more room indoors with the touch of a button; a "floating" platform called the Magic Carpet, which can double as a tender station or restaurant/bar depending on where it's located; six new-to-Celebrity restaurants; and the largest spa in the fleet. After it launches, the ship will operate a series of Eastern and Western Caribbean cruises from Fort Lauderdale, before repositioning to the Mediterranean; it also will sail a mini-cruise from Southampton, UK.